Carpenter's squerr or tuils, the infant Jesus, staff wi lily blossoms, twa turtle doos, rod o spikenard. Catholic Kirk, unborn childer, faithers, immigrants, wirkers, employment, explorer, pilgrims, traveller, carpenters, realtors, against dout an hesitation, an o a happy daith, Belgium, Canadae, Croatie, Korea, Indonesie, Zapotlan, Vietnam, Tagbilaran Ceety, Bohol, Mandaue Ceety, Cebu, Philippines, an mony ithers. 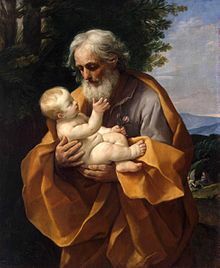 Joseph (Ebreu: יוֹסֵף‎, transleet. Yosef‎; Greek: Ἰωσήφ, translit. Ioséph) is a feegur in the Gospels that wis mairied tae Mary, Jesus' mither, an, in the Christian tradeetion, wis Jesus's foster faither. This page wis last eeditit on 3 November 2018, at 17:50.